Every dog and cat deserves a chance at a loving home, but that chance isn’t always given to those who spend part of their lives in animal research labs. The tragic reality is that many of these animals are euthanized once they're deemed no longer useful. In Maryland, the ASPCA has been working hard to pass a bill that would require the state’s research facilities to make dogs and cats available for adoption once testing is over, giving hundreds of dogs and cats the opportunity to experience life as pets. The legislation, often called the Beagle Bill because the Beagle is the most commonly used breed of dog in research, is a common-sense animal-protection bill. It does not restrict research itself—it would simply require research institutions to work with willing animal rescue organizations to find homes for pets once they are no longer needed. This bill has massive public support but faces heavy opposition from the University of Maryland and Johns Hopkins University, both of which run research laboratories that use animals. In protest, students at Johns Hopkins posted an online petition that quickly earned nearly 35,000 signatures. Yesterday those signatures were delivered, in person, to Ron Daniels, President of Johns Hopkins University, Maryland Senator Joan Carter Conway, Chair of the Education, Health and Environmental Affairs Committee, and Maryland Delegate Maggie McIntosh, Chair of the House Appropriations Committee. We hope that this gesture will encourage Maryland state legislators to do the right thing and pass the Beagle Bill. The bill must move by March 20 or it will be dead for the year. If you live in Maryland, please urge the General Assembly to pass S.B. 420/H.B. 528, the Beagle Bill. 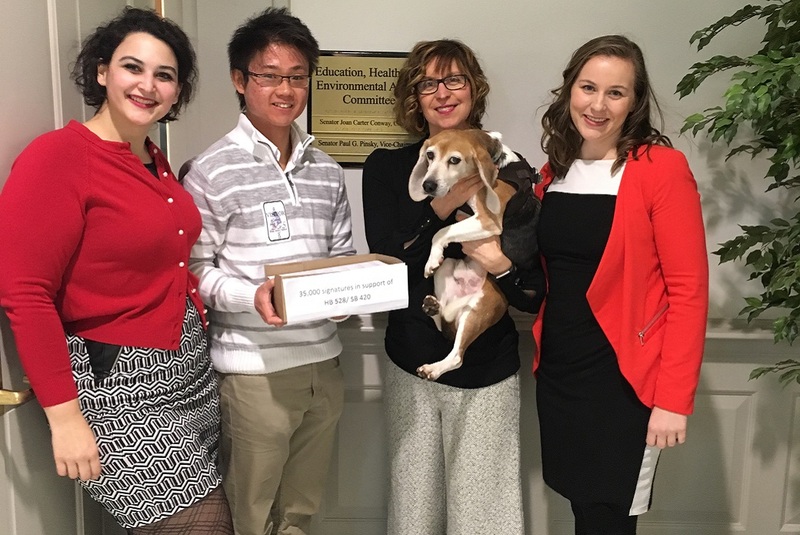 Petition deliverers, left to right: Emily Hovermale, Maryland State Director for HSUS; John Yap, President of Johns Hopkins University’s Pet and Animal Welfare Society; Gail Thomssen and George, her rescued Beagle; Chloe Waterman, ASPCA Senior Manager of State Legislative Strategy.